Based on the novel by Michio Takeyama, The Burmese Harp is the story of a Japanese soldier who is wounded during the final days of World War II where he disguises himself as a Buddhist monk where he would find enlightenment. Directed by Kon Ichikawa and screenplay by Natto Wada, the film is the story of a man whose encounter with war forces him to find some idea of hope and meaning in his life. Starring Rentaro Mikuni, Shoji Yasui, Taniye Kitabayashi, Tatsuya Mihashi, and Yunosuke Ito. The Burmese Harp is an evocative yet devastating film from Kon Ichikawa. Set during the summer of 1945 in Burma during the final days of World War II, the film follows a Japanese regiment who are captured by the British as one of them volunteers to tell another regiment that the war is over and Japan has surrendered. What happens instead becomes a traumatic moment where he is later saved by a monk only to become one as his regiment wonders what had happened to him. It’s a film that explores not just the horrors of war but also the sense of loss he would encounter as it’s not just seeing these bodies of fellow Japanese soldiers he would see. It’s also in the fact that they would never return home to a country that’s been torn apart by war and will never get some form of redemption. Natto Wada’s script is told mainly from the perspective of another soldier who recalls the events from their capture to being one of the regiments to accept the news over their country’s surrender as they’re taken to a prison camp where they’re treated fairly by the British. During the course of the film such as the first act where the regiment led by Captain Inoyue (Rentaro Mikuni) who trying to maintain morale amongst his troops as he knows they’re tired, they’re hungry, and worn-out from fighting as the one thing he can to help them is have them sing with PFC Mizushima (Shoji Yasui) playing a Burmese harp. The second act revolves around Captain Inouye and the regiment wondering to Mizushima during his mission to tell another regiment about news on the war as they believe he’s dead until they see a monk who looks like him when they’re passing by a bridge they’re building. Though it is clear who the monk is, it shows the things that he would encounter that forces him to go into a vow of silence but also deal with the monstrosity of war. Kon Ichikawa’s direction is definitely mesmerizing in the way he would capture a time of war as it’s about to end. 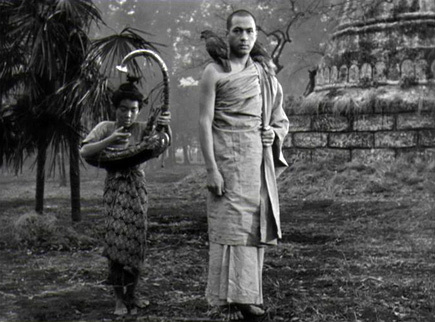 Though it is shot mainly in Japan, Ichikawa would maintain a look and feel through the forest and rural locations that it is shot in Burma as there would be a few exterior shots of the temples in Burma. While Ichikawa would create some amazing wide shots to capture the scope of the locations as well as a look of the prison camp which feels more of a camp than a prison. He would infuse some close-ups and medium shots to capture the look of the cabins from the interiors where the soldiers would trade with an old woman who would walk into the camp occasionally. The scenes relating to Mizushima and his own encounter with the horrors of war from the bodies he would find during his walk toward the location of the camp as well as seeing a funeral procession for unknown soldiers. It adds a lot to the tone of the film as it include a scene in the third act where Captain Inouye is leading his regiment to sing a song in front of a large Buddha statue where Mizushima is inside playing a Burmese harp as it add to some form of musical dialogue. Even in the film’s climax as it play into this sense of loss over the fallacies of war and what would it cost as these men would have to go home knowing they lost a war which they feel is unimportant. Overall, Ichikawa crafts a somber yet intoxicating anti-war film about a soldier’s encounter with death and chaos that forces him to find some sort of spiritual meaning. Cinematographer Minoru Yokoyama does brilliant work with the black-and-white photography as it has a very natural look to the scenes in the day with some low-key lighting by Ko Fujibayashi for some of the interiors at the cabin at night. Editor Masanori Tsuji does excellent work as it play into the drama as well as a key sequence of a regiment trying to battle it out against the British only for everything go wrong. Production designer Akira Nakai and art director Takashi Matsuyama do fantastic work with the look of the prison camp and the cabins the prisoners live in as well as some of the interior of the temples. The sound work of Masakazu Kayima is amazing for the way some of the music is presented as well as the few moments of gunfire and such that occur in the lone battle scene. The film’s music by Akira Ifukube is incredible for its mixture of lush orchestral music, broad choir music, and somber harp music that is performed by Yoshie Abe. The film’s wonderful cast include some notable small roles from Jun Hamamura as Private Ito, Taketoshi Naito as Private Kobayashi, Ko Nishimura as the soldier Baba, Yunosuke Ito as a village head that would help the soldiers try and trick the British, Tatsuya Mihashi as a defense commander refusing to surrender, and Taniye Kitabayashi as an old lady who would trade with the Japanese prisoners at the camp as well as show kindness to them. Shoji Yasui is remarkable as Private Mizushima as a young soldier who volunteers to appeal to a fighting regiment to surrender that nearly dies from the battle as he becomes traumatized where he pretends to be a monk only to become one to cope with the loss he is carrying. Finally, there’s Rentaro Mikuni in a phenomenal performance as Captain Inouye as a man dealing with the chaos of war as he would accept the reality of what happened to Japan where he also raises morale for his regiment and see what Mizushima had become. 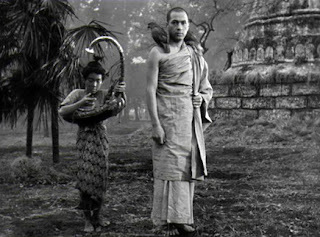 The Burmese Harp is a tremendous film from Kon Ichikawa. Featuring a great cast, gorgeous visuals, a fantastic score, and themes on war and the loss that it would bring war. It is an anti-war film that showcases the horrors of war and how it would affect a man to withdraw into some idea of spiritual fulfillment. In the end, The Burmese Harp is a spectacular film from Kon Ichikawa.